1. 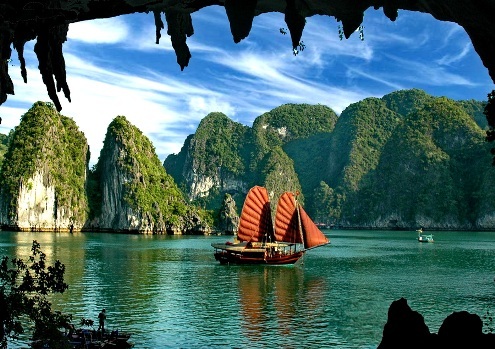 Taking a traditional junk boat cruise is the best way to explore the mythical Halong Bay. It is recommended to stay overnight onboard so that you have more time to discover the spectacular limestone formations, natural grottoes and floating villages. 2. Visiting a traditional floating village to experience the daily life of local fisher men is a popular activity. 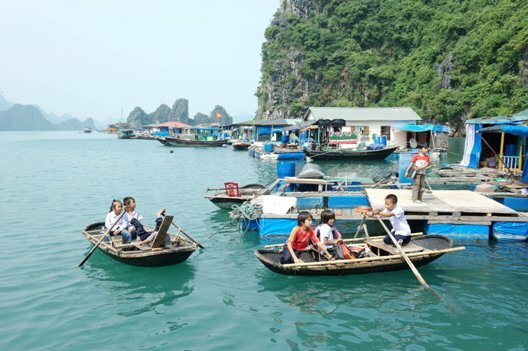 From generation to generation, these fisher men and their families have been living amongst the magnificent beauty of Halong bay and earning their livings from its abundant seafood supply. You also have a chance to see and meet lovely children playing and studying on the floating houses. 3. 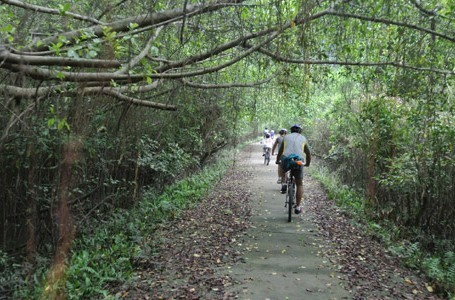 It is also recommended to go cycling on Cat Ba Island. Cat Ba is famous for its impressive natural beauty with diversified range of species and fascinating natural habitats. You can explore this beautiful isle either on foot or by bike to the limestone hills, natural lakes and grottos. If you are lucky enough, you can see the Cat Ba Langur hidden in the coastal limestone forests. You should book a 3 day cruise to reach Cat Ba Island. It cruises from Halong Bay to Lan Ha Bay and disembark at the southern coast of Cat Ba, Viet Hai pier, where you can rent the bike or start your walking. 4. Discovering caves and grottos on Halong Bay is another interesting activity. Halong bay with thousands of jungle-covered peaks rising dramatically out of the emerald waters posses a large number of natural caves, isolated grottos and picturesque hidden coves of all shapes and sizes. 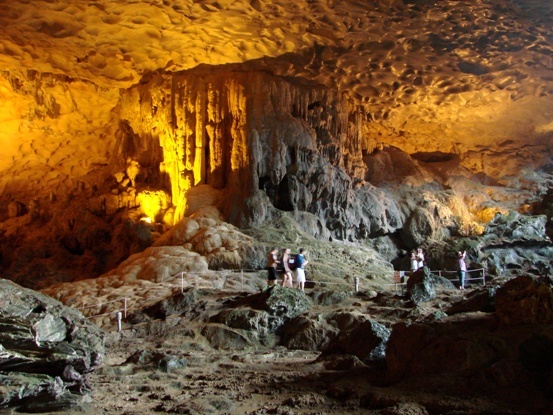 Thien Cung Cave or the Heavenly Palace Cave, Dau Go Cave or known as the Cave of Wonders, Sung Sot Cave or Surprising Cave, Trong Cave or Drum Cave are the most beautiful and popular caves. Yet, there are several hidden caves waiting you to explore. 5. You love adventure and wild life? Kayaking between karst limestone outcrops to find hidden lagoons is just right for you. Hop on a kayak and explore the beauty of the bay up close. Sailing through caves then finding out small lagoons surrounded by limestone peak will bring you awesome feelings. There, you can see many special plants and animals in these areas. Halong Bay with many isolated white sandy beaches is one of the best destinations to swim in Vietnam. You should sail further to the Lan Ha Bay or Bai Tu Long to visit these beaches. Imagine only you and your beloved partner on a private, unspoiled beach. It will be a unforgettable moment for you two! 6. Visitors are also attracted by Halong Bay’s food. The authentic Vietnamese cuisine, with its rich seafood delicacies like crab, clams, prawns, lobsters, lamprey and more, is a must-try. 7. Get a bird’s eye view of this marvel of nature as you take a helicopter tour from Hanoi to Halong. $650 per person for a round trip is all you need to pay for an experience of a lifetime!